Credit card points are one of the three main types of credit card rewards, the others being cash back and miles. Cardholders can earn points in many ways, including making purchases, spending a certain amount within a few months of opening an account, or referring a friend (some cards are from WalletHub partners). With a points credit card, you will almost always earn at least 1 point per $1 spent on all purchases, but certain cards will offer more. Some cards will offer the same amount of points across all purchases, while others will reward certain categories of spending (e.g. gas, groceries, restaurants) with extra points. You can generally redeem credit card points for travel, merchandise, cash back, or gift cards. In some cases, you can also redeem for exclusive events or donations to charity. Each issuer offers a different range of options and sets their own redemption prices. For example, your points may be worth 1 cent each when put toward travel and half a cent each when spent on cash back. Although each issuer has their own specific instructions for redemption, you can usually redeem your points by logging into your online account and going to your issuer’s rewards center, where you can see your choices and how many points they cost. Below, you’ll find an in-depth guide to points, which includes information on how to obtain them, what you can use them for and how to redeem them. We’ll also show you how some of the best points credit cards compare to one another. The best way to earn credit card points is to pick the right credit card and use it responsibly. You should utilize your credit every month, but not exceed 30% of your credit line. With the vast majority of points cards you can expect to get at least 1 point per dollar across all purchases. Your everyday spending will add up and become savings in the future when you redeem your points. But it’s always important to remember not to spend beyond your means for more rewards. It won’t be worth it to get a few extra points if you end up going into debt. But that said, regular spending isn’t the only way to earn credit card points. Let’s take a look at a few other methods. Day-to-day spending. Points credit cards reward you for every dollar you spend. You may even get extra points for making certain types of purchases. For example, a credit card might offer 3 points per dollar on all travel purchases (hotels, airfare, etc. ), while giving 1 point per dollar on other types of purchases. Initial bonuses. Many credit cards will allow you to earn a large sum of points when you first get the card. Usually to get it you’ll either have to make a first purchase or spend a certain amount of money within a certain number of months. Milestones. Some cards will give you bonus points every year on the anniversary of when you opened your account, to thank you for your continued use. Others will reward you for making a certain number of purchases per month, spending a certain amount in a year, etc. Adding an authorized user. If a card offers extra points for adding an authorized user, that person will typically have to make a purchase or spend a certain amount of money in a certain timeframe before you can earn the bonus. Referring a friend. Some issuers might reward you for bringing them new customers. You’ll create a referral link to share with friends and family, and if any of those people get approved you’ll receive extra points. So there are a lot of different ways you can earn credit card points, but not every card will offer every option. That’s why it’s important to shop around. A good place to start your search is WalletHub’s list of the best points credit cards. Credit card points are usually worth about one cent each. But it can vary, depending on both the credit card company and what you spend the points on. With some cards, your points will be worth the same amount no matter what you use them for. But with others, you’ll be incentivized to redeem for certain things. Some cards will offer far worse value, such as only half a cent per point, for certain types of redemptions. It’s important to read up on point redemption before you apply for a card. And if you’d like to keep your redemption options open and earn rewards you can use for anything, you could instead go with a cash back credit card and avoid the point value issue altogether. Credit card points, like miles and unlike cash back, can be devalued. Since the credit card issuer says how many points it costs to redeem for each option, they control the value of the points. That means they have the power to suddenly charge more points for an item, and to lower the points’ value. Cash, on the other hand, has an independent value and cannot be devalued by credit card companies. So if you do decide to get a points card, you should redeem your points often to minimize the chance of devaluation. The point redemption process differs by issuer. But normally you start by logging in to your online account. From there, you should be able to navigate to a rewards area where you can trade your points for various things. Some issuers will even have a separate website dedicated to reward redemption to make things easier on you. And you may be able to redeem your rewards through third-party sites like Amazon or apps like Uber. If you’re having trouble with redemption, you can always call your issuer’s customer service line. Travel. Points credit cards that are marketed as travel credit cards will often give you the best value for travel redemption. You can trade your points for airfare, hotel stays, cruises and more. Depending on the card, you might have to use your points immediately when you book (and you may be required to book through your issuer too), or you might be able to redeem points to wipe purchases off your bill after the fact. Gift cards. Many credit cards will allow you to trade points for gift cards to various retailers. This option often gives less value than others, though. Merchandise. You can sometimes spend points in an “online shopping mall” to buy products ranging from electronics to kitchenware to clothes. Cash back. If you don’t have any use for any of the available options, you can usually trade your points for a check in the mail or a statement credit. But since these cards usually aren’t meant for cash back redemption, you sometimes won’t get as good of a value. Chase Freedom® is an example of a points credit card that does give good cash back redemption value. Loyalty programs. Some cards, such as Chase Sapphire Preferred, will let you transfer points from your card to the loyalty programs of hotels or airlines. This can sometimes give you better value on your redemption. Third-party sites. This includes things like “Shop with Points” on Amazon or using your points with services like Uber. Charitable donations. You may have an option to donate your points to charity. Usually, your points won’t be worth very much with this method, so it might be best to redeem for cash back and handle the donation on your own. In conclusion, there are several key things you should consider when it comes to credit card points. 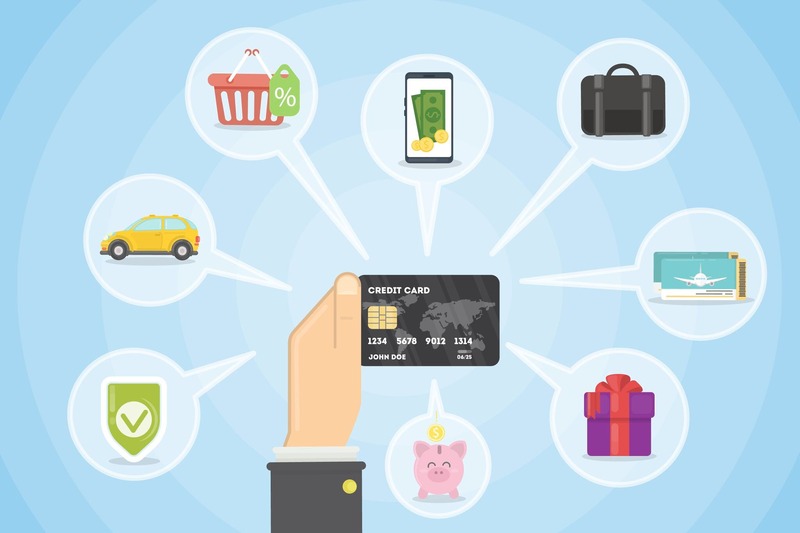 You need to decide whether to get a card with consistent points across all purchases or increased rewards in certain areas. Base your decision on your spending habits. Then, use your card regularly, but not excessively, in order to earn and redeem rewards.. And you need to fully understand all your redemption options, especially how much your points are worth with each. And if you’re unsure of where to start when it comes to points cards, you can sign up for a free WalletHub account in order to receive free personalized credit card recommendations.